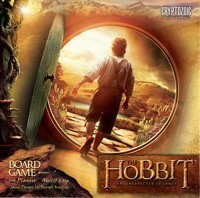 The Hobbit: An Unexpected Journey Board Game, an exciting game of adventure in which you join Bilbo Baggins™ and his 13 Dwarven companions on their journey through the Lonelands and Misty Mountains, encountering Goblins, Trolls, and other dangers that seek to put an end to their adventures. Traverse your way through two boards, each more difficult than the last, with the goal of coming out alive and prepared for the dangers that lie ahead. Your accumulated points at the end of the game will be your personal mark for finding out how good of an adventurer you really are! Add a Review for "The Hobbit: An Unexpected Journey"